Her fans threw her a surprise birthday! (SPOT.ph) Maine Mendoza got an early birthday present from her dedicated fanbase after they threw her a surprise party yesterday, March 1. Fan groups reportedly coordinated with Maine's management to arrange a Coachella-themed party at Elements at Eton Centris, Quezon City. The event, which was documented by Nice Print Photography, was decked out in colorful streamers, white lanterns, pastel-colored balloons, and a stage with floral bouquets and a tent a la Coachella. 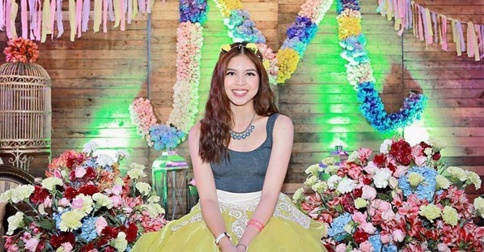 True to her bubbly self, Maine gamely went onstage to dance with her fans. Yaya Dub looks glamorous posing for the cameras. Her family came out in full-force to celebrate her 21st birthday.